Home Gut Health Patients Horrified When Doctor Tells Them to Eat THIS! Patients Horrified When Doctor Tells Them to Eat THIS! Now, here’s where you might think I’ve gone off the deep-end. I want you to eat “rotten” food. It’s probably not very often you hear your doctor telling you to eat spoiled food. But, that’s exactly what I’m telling you to do. In the previous e-mail I wrote on leaky gut, I mentioned that I’d tell you about some of the easy fixes for the prominent gut malady. The first thing you need to know (as I covered previously) is that you need must eliminate foods that aggravate and harm your intestinal lining. But, that’s not all of them. It’s a fairly exhaustive list, especially if you eat a Standard American Diet (SAD). And, you while I’m going to sound like a broken record here (or a skipping YouTube video), you should also make sure to eat organic fruits and veggies, grass-fed beef, pasture-raised chicken, wild-caught fish, and a variety of nuts and seeds as well. But, like I said, I’m about to take it one step farther and advise you to eat a kind of food that’s not that popular in America. I want you to eat fermented foods and lots of them. Take our Digestive Health Assessment to help figure out if you would benefit from the gut healing properties of fermented foods. Most people think fermented means “rotten food”. Well, that’s not quite accurate, and if you give me a moment to explain, I’ll show you why fermented doesn’t mean rotten, and why fermented also could help spell an end to leaky gut. Fermented food is food that’s undergone a fermentation process. Most alcohol undergoes a similar process as it’s being made. The specific process is referred to as lactofermentation. What happens during lactofermentation is natural (healthy) bacterias break down food as they feed on the starches and sugars inside the food. The end result is your food is then left with a build up of lactic-acid. Now, the nifty (couldn’t help myself) part about the fermentation process is it helps to preserve many of the nutrients inside of the food as it ferments. That means valuable enzymes live on as the food ferments, and so do b-vitamins, as well as nutritive Omega-3s along with numerous different probiotics (healthy bacteria). Whereas cooking food to make it digestible will often degrade or destroy these nutrients, lactofermentation allows for the nutrients to remain while still making the food much easier to digest. If you suffer from leaky gut, anything you can do to facilitate the digestion process will be helpful at fighting off diseases and auto-immune conditions. Not to mention the billions, and sometimes trillions, of probiotics inside of fermented food create a welcoming environment for the easy digestion of food. Truthfully, we’re not the first to discover how helpful fermented food is for the gut. We (modern doctors and scientists) were only the first to discover the link between fermentation and a healthy gut profile based on empirical evidence. 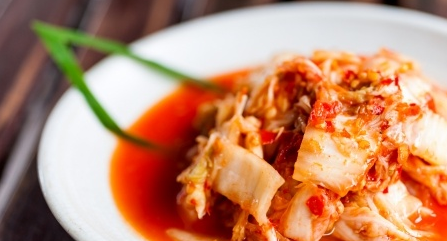 Koreans have been eating a fermented form of cabbage called Kimchi for hundreds of years. And Germans have been eating Sauerkraut for centuries as well. Other cultures have used kefir ( a fermented drink made of dairy, goat’s milk, coconut milk, and other beverages) for just as long, if not longer. But, when scientists discovered the link between bacteria and disease, fermented foods were tabled (or trashed) in favor of pasteurized and processed foods that were deemed “safe.” Too bad they were so far from the truth. How’s that for a reason to eat fermented foods? Now while this might sound well and good, you might be wondering what the downside of fermented foods might be, after all eating rotten food has to be at least kind of bad for you, right? The Downsides of Fermented Foods…Are There Any? I’ll be upfront.The only downsides to fermented food are the inability to access a wide variety of them, as well as learning to acquire the taste for them. If you drink alcohol, you might remember back to a time when you first began to drink (legally or not). I won’t judge. Wine or beer probably didn’t taste all that great when, before, you were used to slurping down sweet sodas. And that’s how it is with fermented foods. If your diet is a SAD diet, then switching over to fermented foods can take some getting used to. What you’ll find is the more you begin to eat fermented foods, along with the less unhealthy food you eat, the more you’ll enjoy them. Some of you might already enjoy these kinds of foods, and to you I say, “Awesome.” Make sure to eat as much as you can. For others, just stick with it and you’ll eventually come to like them. As I mentioned, access to fermented foods can be a bit of a hassle, mainly because you can generally only find fermented foods in health food stores. The good news is you can start fermenting your own food. It’s a remarkably easy process as all you have to do is set it and forget it. If you want to learn the ins and outs of the process I recommend The Art of Fermentation or Cultured Food For Life. I have been experimenting with different fermented foods from home and have created some interesting concoctions. My partner Dr. Lantelme also has some sauerkraut brewing at home because we both believe in the importance of incorporating these types of food into the diet. I should mention that some grocery stores are beginning to carry more of these foods. Some examples are: and is and will and you are will and can I have you pick me up some, to? Kombucha: This fermented green or black tea is exploding in popularity. It tastes great and packs billions of healthy probiotics inside. Kefir: Sometimes referred to as drinkable yogurt, it’s available in many stores Most kefirs are dairy, but you can find some made of coconut. I recommend making it on your own. Salami and other cured meats. Believe it or not, high-end meats like this have been injected with cultures that actually ferment the meat. This allows the meat to stay out for a while without the need for additives. Also tough to find high quality meats in the store. Sauerkraut is probably the most popular fermented food. All you need is a little salt and cabbage and you can start to make your own cultures. If you get it from the store, make sure it is refrigerated and bubbling otherwise you are just buying salted cabbage. Beets: Beets are another great vegetable for fermenting. Truth be told, eating fermented food and purging your diet of food from the SAD could be one of the most cost effective ways imaginable to control your health. I’m not sure if you’ve priced out trying to stay on top of many of disease like cancer and arthritis, but it’s not cheap. These easy fixes are proven to help and will often make you feel better quickly.